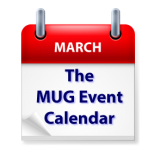 Two excellent speakers highlight this week’s MUG Event Calendar. Jason Snell of Six Colors will share his thoughts on all the recent Apple developments at one California group, while another will have a visit from Field Guide author David Sparks. Outside of California, a Michigan group will host a demo fair, a German group will focus on Yosemite, and another California group will look at photo software from JixiPix. North Coast Mac User Group -Internet, Security, Phishing…OH MY!